On Sunday, January 17th, Gracie sent her binkies to the babies in Heaven. 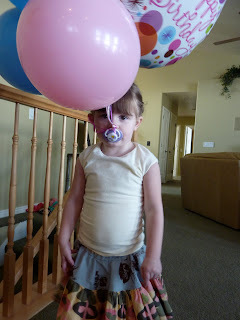 We tied one up to some balloons and let them go.....with some resistance from Gracie. After a few minutes of not letting it go we had to help her and since then she hasn't had any binkies. 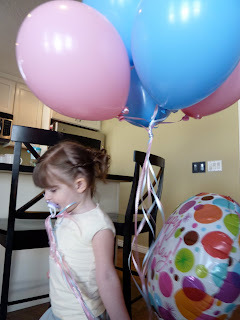 The first few days she would ask for her "blue binkie" because she knew that we had sent the clear one on the balloons and figured we still had the blue one. There were some rough nights but she did really well and now looks a lot older without the binkies in her mouth.